Core i7/i9 with GTX 1070, or Ryzen 7 2700 with Radeon Vega 76? Have it your way. 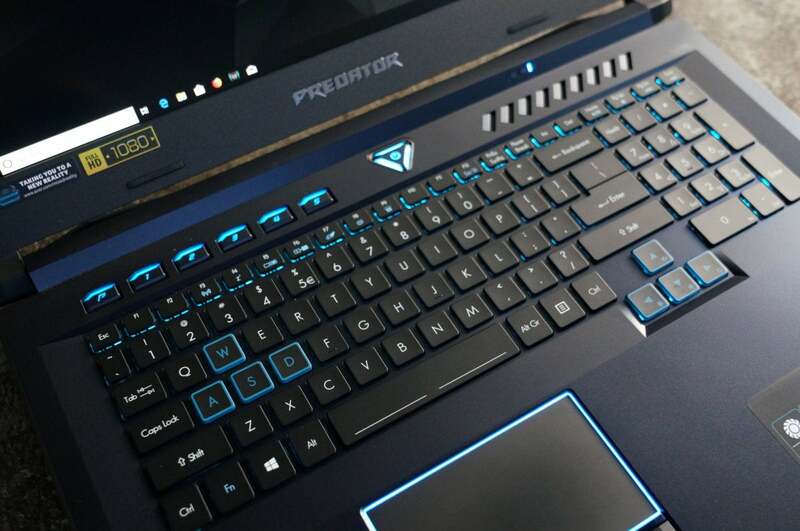 The Acer Predator Helios 500 gives you something few gaming laptops do: Choice. Sure, most let you pick what color to set the LED or the wallpaper, or offer tuning software. But if you want a substantive change, as in something other than Intel or Nvidia, your options are sparse. That's not the case with the Predator Helios 500, though. This burly and powerful gaming laptop lets you pick what you want inside, with the unique luxury of either going with the typical duo of Intel and Nvidia, or going all-AMD. The outside of the Predator Helios 500 seems pretty much standard fare for gaming laptops and very, well, Acer Predator. It has that mix of aggressive lines and exhaust ports that the company has been working toward for the last few years. And, like others, anodized cooling fins accent the laptop exhaust ports. It's a little thing, but the blue heatsinks, like a good carpet, can really tie the room together. The Acer Predator Helios 500 features blue annodized cooling fans to give it that extra touch. For ports, the Predator Helios 500 features HDMI, DisplayPort, 3 USB 3.0 ports, Gigabit Ethernet and two Thunderbolt 2 ports. Power for the laptop is a 230-watt brick that properly plugs into the back of the Helios 500, rather than on the side, where it could interfere with your mouse. There are these nouveau thin gaming laptops, and there are old-world hulky, thick laptops. The Predator Helios 500 clearly falls into the latter group. It weighs 8.8 pounds not counting the 3-pound power brick. It measures 16.9 x 11.7 x 1.5 inches all around. There are good reasons for that bulk, though: performance and expansion. Most thin gaming laptops at best offer you two M.2 drives, but most give just one. The Predator Helios 500 offers up to two M.2 slots and a 2.5-inch drive bay for up to 5TB of magnetic storage. For RAM, the Predator Helios 500 features two memory modules tucked somewhere under the keyboard, with an open pair of SO-DIMM slots for another 16GB of RAM if you need it. You can't do that on a thin and light gaming laptop. The RGB keyboard is a dome-switched variety that doesn't offend. When we mean offend, we mean there's no obvious weird placement of keys. The trackpad also features an LED outline and, again, has no issues. There's a set of six programmable macro keys along the top as well. The screen is a Full HD (1920x1080) "ComfyView" 17.3-inch panel, which Acer describes as using IPS. 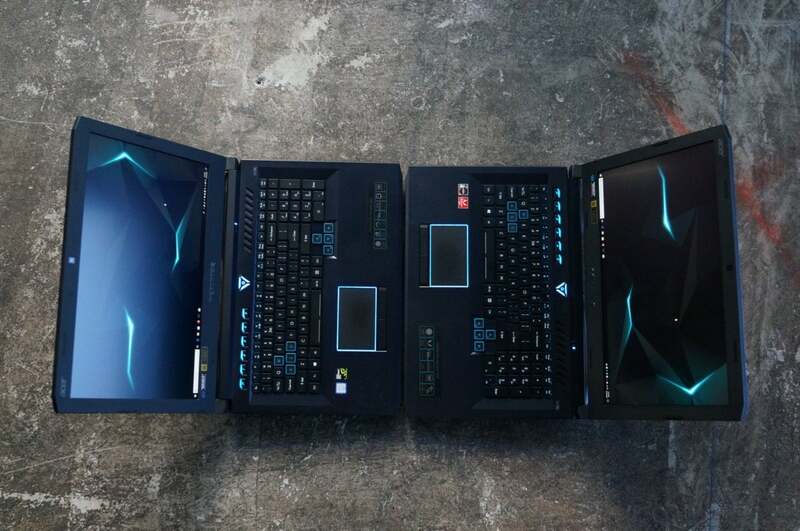 Upon diving into the panel used in two of the laptops, we found them to be AU Optronics using AHVA. That stands for Advanced Hyper Viewing-Angle, which is AU Optronics' version of Sharp's IPS technology, which some like to call "IPS-like" to avoid violating trademarks. What's likely more important for gamers is the refresh rate, which is 144Hz. And yes, there are two versions. If you go with the Intel and Nvidia version you get G-Sync, while the AMD version nets you a FreeSync monitor. 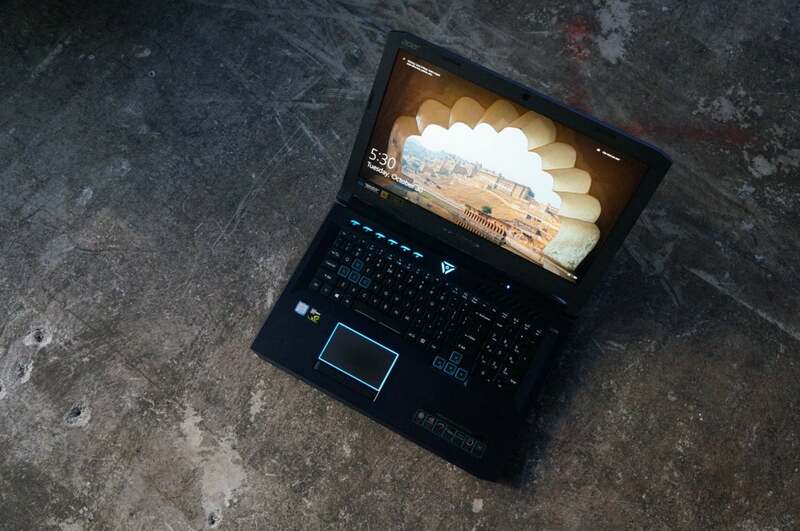 Intel and Nvidia power the bulk of gaming laptops today. All that leads to the choices of the components you get for the Helios 500. For Intel you get a choice of a 6-core 8th-gen Core i7 8700H with a GeForce GTX 1070, or a 6-core Core i9-8950HK with GeForce GTX 1070. 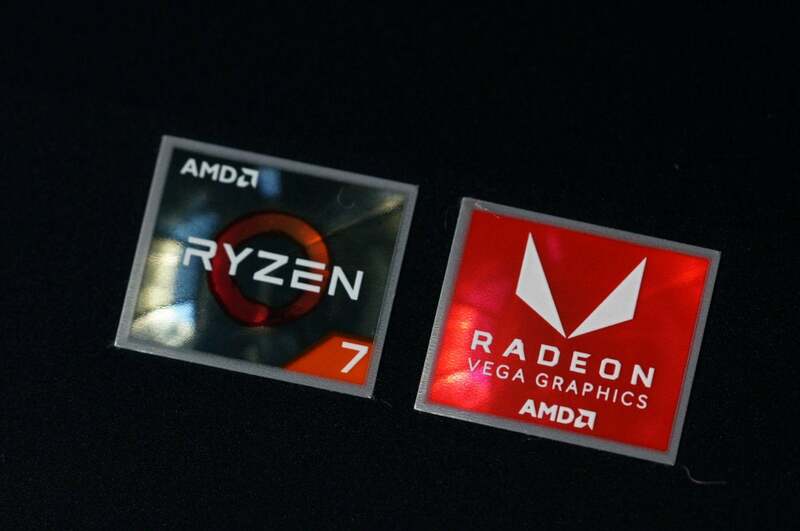 Go with AMD, however, and you can get an 8-core 2nd Gen Ryzen 7 2700 and a Radeon RX Vega 56. All three configurations wisely offer 16GB of DDR4—you just don't need more than 16GB for gaming today, and any more is just a waste of money for most. Where we take issue is with storage. The Core i7 gets you a 256GB M.2 SSD and 1TB hard drive, while the Core i9 configuration nets you 512GB and a 2TB hard drive. When you get to the AMD version, storage gets cut to a single 256GB SSD. To average gamers, 256GB sounds like a lot. But given that modern games demand in excess of 50GB of storage space, you could run out fast. We're frankly puzzled as to why Acer didn't just install a 1TB hard drive in the all-AMD laptop, because it has space for it. It's been a long time since we've seen so much red. 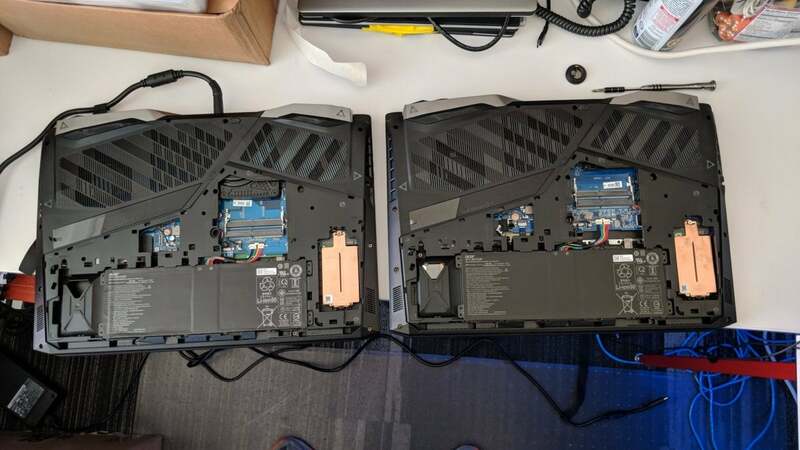 In fact, if you look at the picture below, you can can see the open hard drive bay in the Ryzen version (left) is empty, while the Core i9 (right) has its 2TB drive in place. There's plenty of room. The Predator Helios 500 has a spot for another M.2 drive under the copper heat spreader on the right below. You can also see that there's room to add more RAM on both laptops if you want to go to 32GB. The easiest upgrade for the AMD version would be to just add a hard drive, but our unit didn't feature the cable (it's proprietary) to hook it up to the motherboard. Acer customer forum posters have said it's in the box. If you can't find the cable, the easiest upgrade would be to add that second M.2 drive to the laptop. AMD Ryzen 7 2700 and Radeon Vega 56 on the left with Intel Core i9-8950HK and GeForce GTX 1070 on the right. 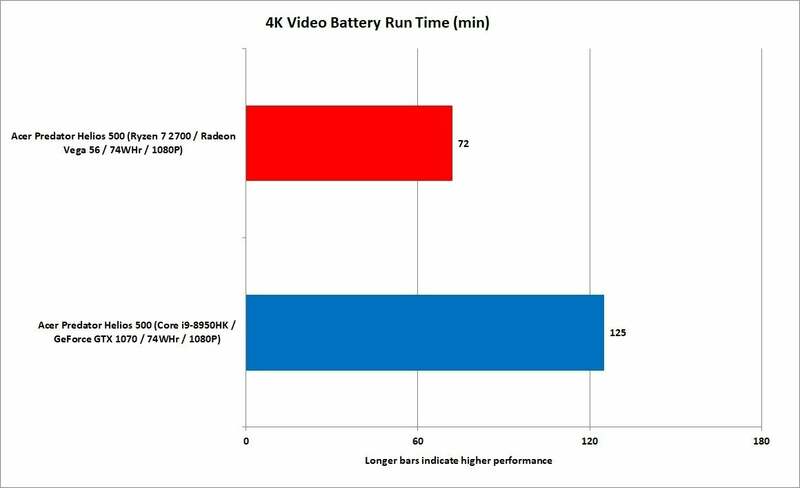 We already wrote a more extensive showdown of the AMD vs. Intel versions of this laptop, but for folks who don't want to click it we'll sum it up: The 8-core Ryzen 7 2700 generally has the edge in multi-threaded tasks such as 3D modelling, video encoding and anything that can really use the power of 16 threads of computing. 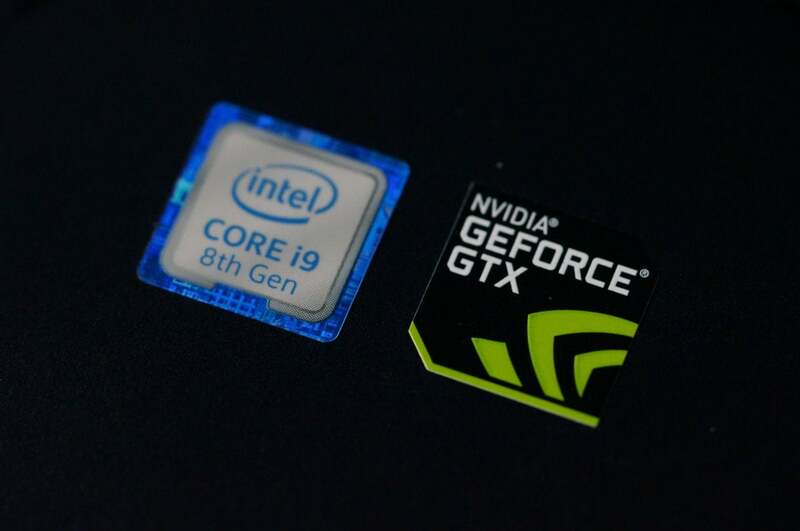 The Core i9 is favored for applications that use fewer threads, such as photo editing and many other content creation apps that don't reach the level of optimization of 3D modelling or other workstation applications. You can see this summed up in the chart below. Using Cinebench R15, we can see the performance benefits each version has using 1 thread to 16 threads. The left side (fewer threads) gives the advantage to the 6-core Core i9. Get to the far right side though (more threads), and the 8-core Ryzen 7 2700 dominates the work. If someone tells you one is better than the other, they're giving you the wrong information. The correct answer is: One is better than the other for certain workloads. Look at what you do, and choose the CPU accordingly. If your work tends to not use that many threads, you'll see more performance out of the Core i9 version of the Predator Helios 500. If however, you intend to buy the laptop for thread-heavy tasks, you'll want the Ryzen 7 2700 version. The Predator Helios 500's GPU is the other major consideration. It's actually the first time we've seen a high-end Radeon GPU in a laptop in a long, long time. 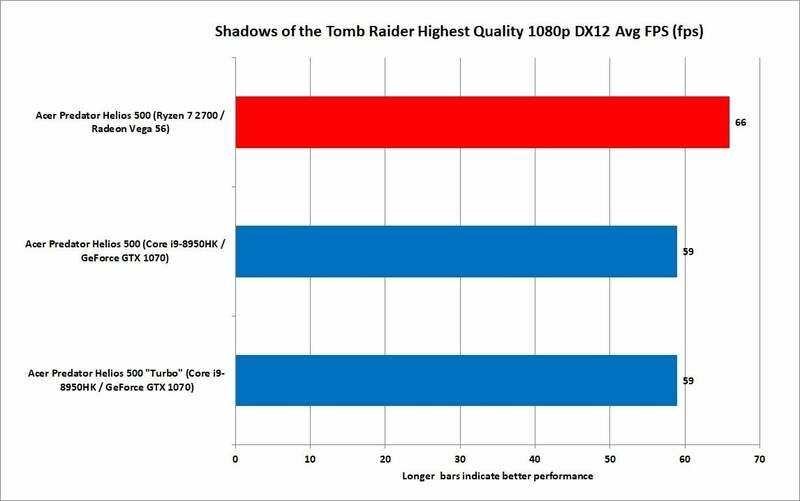 We'll point you once again to our AMD vs. Intel writeup for more details, but we'll break out probably the most relevant chart here, which looks at performance of the newest Shadows of the Tomb Raider at 1920x1080 set to Highest Quality. Although the higher-clocked Core i9 usually gives the GeForce combo a shot in the arm, in newer games that are more GPU-intensive and support more CPU cores, the Radeon RX Vega 56 and Ryzen 7 2700 come out on top. To sum up, while there are games where the higher clocks of the Core i9 give it the edge, the Radeon RX Vega 56 seems to have the same advantage over the GeForce GTX 1070 as it does in desktops. Out of the box, the Intel/GeForce version of the Predator Helios 500 supports pre-approved overclocking profiles. Both components offer up decent performance boosts, with most of the heavy lifting coming from the CPU. Neither of the overclocking profiles are so aggressive that that would break the laptop. To make it even safer, once you reboot, your overclock goes away. Our overclocking attempts using the included Ryzen Master software on the AMD version were less successful. It didn't include factory overclocking profiles, and manual overclocking didn't yield much. For example, we tried to squeeze 200MHz out of all of the CPU cores, and were met with black screens. We suspect the newness of Ryzen and Vega to be the root cause. Both chips are so new to laptops that Acer hasn't had time to properly tune for them. What's truly counter-intuitive, however, is the fan noise. 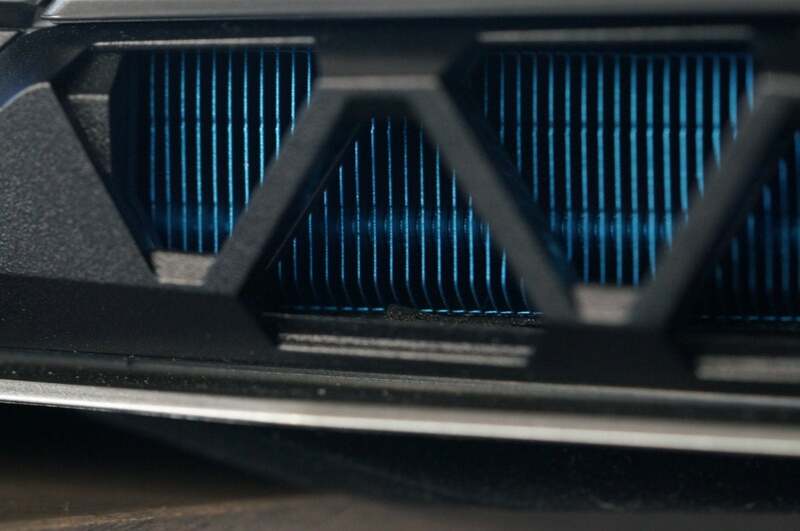 When you run the Intel and Nvidia configuration of the Predator Helios 500 hard, the fans kick up to high levels. You'd expect the Ryzen and Radeon Vega to be even louder, because they're basically desktop chips, but they're actually very quiet. In fact, the Ryzen and Radeon configuration is among the quietest we've experienced in a gaming laptop. And no, that wasn't the cause of our bad luck with overclocking. We tried overclocking the Ryzen and Radeon version with the fans at maximum speed and didn't get any further. We don't really consider battery performance of bulky 17-inch gaming laptops to be a critical consideration, but you still want to gawk at the numbers like you do at a train wreck. Both are basically not great, with just over two hours from the Nvidia/Intel laptop. The AMD laptop is an atrocious 72 minutes. And we weren't even playing a game—this was both laptops playing video, which is cruise control for a modern computer. The battery life on the Nvidia/Intel laptop is made worse by the G-Sync panel. For G-sync to work, the discrete GPU has to be on all of the time, rather than deferring to the integrated Intel graphics during lighter demans. The AMD laptop, of course, has no integrated graphics so the GPU is on all of the time. In the end, as we said, you really shouldn't care about battery life in this class of laptop. You're always going to be disappointed, and you're always going to be on AC. Battery performance isn't good on either, but the desktop chips in the AMD version don't help it. 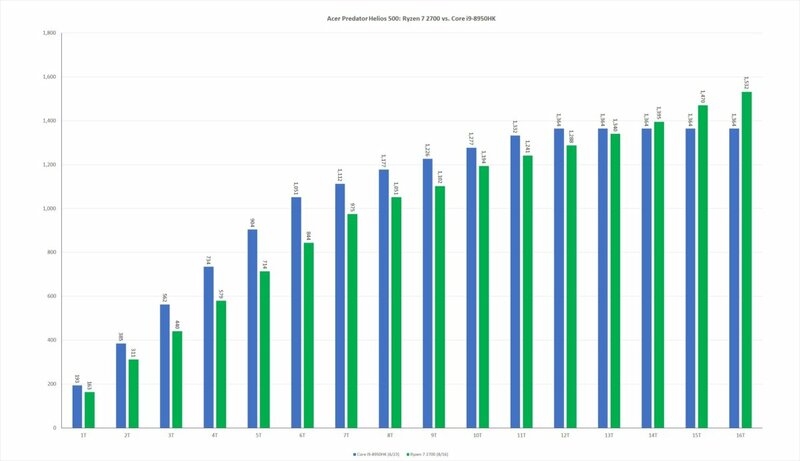 Should you buy the AMD or Intel Predator Helios 500? For most people, the Core i9 offers better performance at lighter CPU loads. It's also the priciest of configurations, as we didn't see it for less than its list price of $2,500. On paper, the AMD configuration seems close at $2,200, but the actual street price of the Ryzen/Radeon version can be found for $400 less. This actually makes it the better buy—if you don't consider the serious storage shortcomings of a 256GB SSD for a large gaming laptop. This story, "Acer Predator Helios 500 Review: A rare chance to choose between AMD and Intel-Nvidia versions" was originally published by PCWorld. The Acer Predator Helios 500's AMD version is the champ for multithreaded applications, plus it's a lot cheaper than its Core i9 sibling. There's just one problem: the baffling 256GB SSD, not nearly enough storage for a large gaming laptop. The Acer Predator Helios 500 Core i9 version offers better performance at lighter CPU loads. It's also the priciest of configurations, though, so you might check out the Core i7 version for better bang for buck.